Located at the vibrant heart of Abu Dhabi's Corniche. The St. Regis Abu Dhabi infuses authentic Arabian hospitality with more than a hundred years of bespoke St. Regis tradition. Positioned a 5-minute drive from Marina Mall, 7-minute drive from the sophisticated World Trade Centre Mall and 15-minute drive from the iconic Sheikh Zayed Grand Mosque. 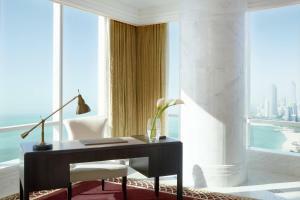 Each of the hotel’s 283 rooms and signature suites revels in a magnificent view of the alluring Abu Dhabi Corniche. The Abu Dhabi Suite, high on the skybridge between the two Nation Towers immerses guests with an astonishing 360◦ view. A signature St. Regis Butler Service is complimentary for every guest in the hotel. Savour the finest flavours from the region and experience a fresh perspective on international cuisine at The Terrace on the Corniche. Villa Toscana serves traditionally rustic and authentic Italian cuisine from Tuscany. The St. Regis Bar offer a lively ambience perfect for after a busy day. Azura Panoramic Lounge is the only alfresco hotspot overlooks the glistening Arabic Gulf and Abu Dhabi Corniche. Cabana Beach Bar & Grill offers a delectable menu of crisp salads, hearty burgers and fresh paninis throughout the day with refreshing cocktails. The Nation Riviera Beach Club is accessible via a private, air-conditioned, marble underpass that runs below the Corniche. Nation Riviera features a 200-meter private beach, secluded cabanas, a spacious infinity pool complete with gardens and a swim-up pool bar as well as exclusive fitness facilities. Treasure Island Children’s Club, is designed as a playful pirate’s ship and provides a safe and enjoyable area for children, with fully supervised indoor and outdoor activities including a pool and water slide. Remède Spa creates a sanctuary for guests and an experience which borders on mystical. Abu Dhabi Mall is a 10-minutes drive from The St. Regis Abu Dhabi. The hotel offers free WiFi in all areas along with free valet parking.